The hardscape that you use to complete your pool deck area can really make the “Wow!” factor for your pool. Not only can it be a complementary extension of your home’s décor, but it also can give your backyard a finished look. There are many types of hardscape you can use – the colors, shapes and textures are endless. The great thing is that they can also be found in materials to fit any budget. Some examples are concrete, natural stone and manufactured aggregates. Pavers used in the landscaping of outdoor swimming pool areas can be beneficial to homeowners and users of the pool area. 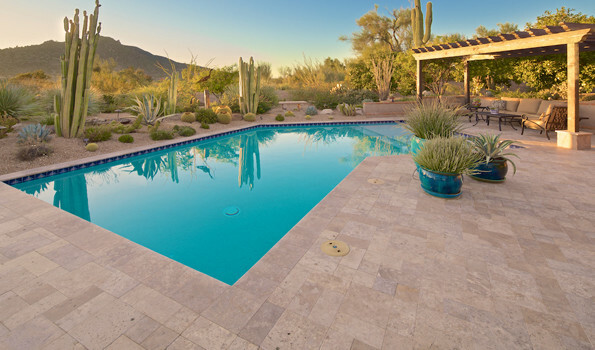 Stone, brick, and concrete are the three main materials used to make these pool pavers. These materials are best for pool paving purposes as they can weather the rigid effects of chlorinated or salt water pools. One feature that pool pavers give is safety. Pool deck pavers are used to realize the desired and chosen texture and color effect of the pool area. These pool pavers also endure a high resistance to wear and tear and a durable non-slip surface. Safety is important as children have the inherent tendency to play and run around on wet and slippery surfaces. A natural stone like travertine is easy to maintain and can add sophistication to any outdoor space. In addition, the rich tones and shade variations can add to its dramatic effect, enhancing the natural beauty. How many times have you gotten out of the pool and the pool deck was so hard it burned the bottom of your feet? One of the main benefits of travertine is the fact that is stays cool to the touch even on the hottest days. The various sizes, styles, and finishes of pool tile make it a versatile design tool. Large square tiles are the most common for pool decking or liners, but you can also find more unique shapes and sizes to meet your needs. Tile is also available in many designs that replicate wood, glass, stone, and concrete that give your pool space that update you’re looking for. Consider using your pool tile to create geometric shapes in of your pool or deck. Rectangles, squares, and other geometric designs convey a contemporary design and will help your pool match perfectly with your other backyard elements. Glass mosaic tile is a contemporary design option for your pool liner, and its shimmering beauty and ability to hold up well to water and moisture make it the perfect option. No matter which you decide, take into consideration the colors and textures that will complement your home’s décor and blend with other pool features. Don’t forget to also take into consideration the wear and tear you will put on your patio (for example, if you have a saltwater pool), as well as how easily they can be repaired and replaced if damaged.